In the past, Gorillaz have done it like this: take a long time, call in a bunch of friends, and come out of nowhere with a masterpiece that’s as good, if not better, than the one before. The Fall is the first album where they break that cycle. That isn’t to say it’s not a fine album–this is still Gorillaz after all and a certain degree of quality can be expected. This is what can be called their “road album” though. It was recorded entirely on an iPad while touring behind 2010’s Plastic Beach. I imagine that’s quite a feat and one could excuse them their lack of resources. For not being made in a conventional studio, the sound quality is great; there is a heavy focus on synths and electronics and therefore we have Gorillaz’ most laid-back, club-sounding record. This is the band at their most chill wave, and there’s nothing wrong with that. “Shy-town” has a down tempo beat that will get you grooving instantly and “The Joplin Spider” sounds like Damon doing an M.I.A. impression (which I assure you, works). The slapdash way in which the album was recorded does become evident though, mainly in the fact that a lot of the tracks do feel a tad underdeveloped. In many cases, I wish Albarn took the time to take these songs a little further. For instance, “The Snake in Dallas” positively begs for Plastic Beach collaborator Snoop Dogg to come drop some rhymes, which would‘ve made it awesome. Instead, it’s just a kind of cool instrumental. “Aspen Forest” could have been this albums hit-up-an-old-white-guy-from-the-late-70’s moment. Shane MacGowan isn’t up to much is he? You haven’t called Howard Devoto yet. Indeed there are a lot of moody, meandering, atmospheric tracks. At least they’re all interesting and they really serve to make the more conventional songs pop. Nowhere is this more clear than on “Bobby in Phoenix.” On this delightful track the incredible Bobby Womack shows up to, what else, talk about Phoenix. “Revolving Doors” is classic Gorillaz that easily could have been a leftover from Plastic Beach. 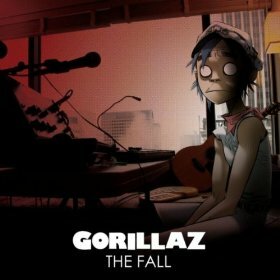 The Fall may have slightly smeared Gorillaz’ perfect record, but that’s not how it should be remembered. It should be remembered for what it is: more damn good music from a master of his trade.